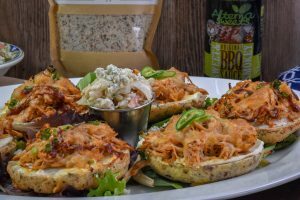 Are you tired of the same old Buffalo wings with bleu cheese and celery at your Super Bowl Party?? 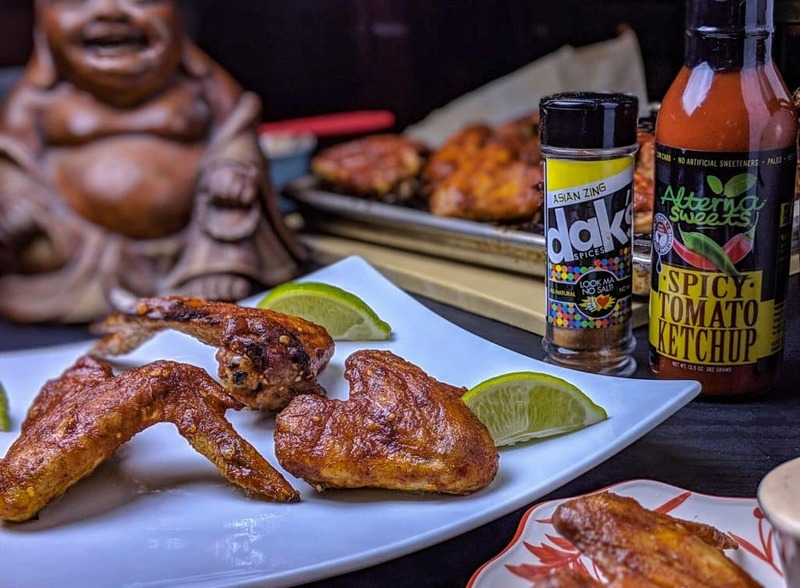 Why not go global and try these low carb keto friendly Vietnamese Sticky Wings using Alternasweets Spicy Ketchup. The sweet and spicy flavor of these low carb sticky wings will have everyone licking their fingers well into the fourth quarter. The secret to making crispy chicken wings is planning ahead. 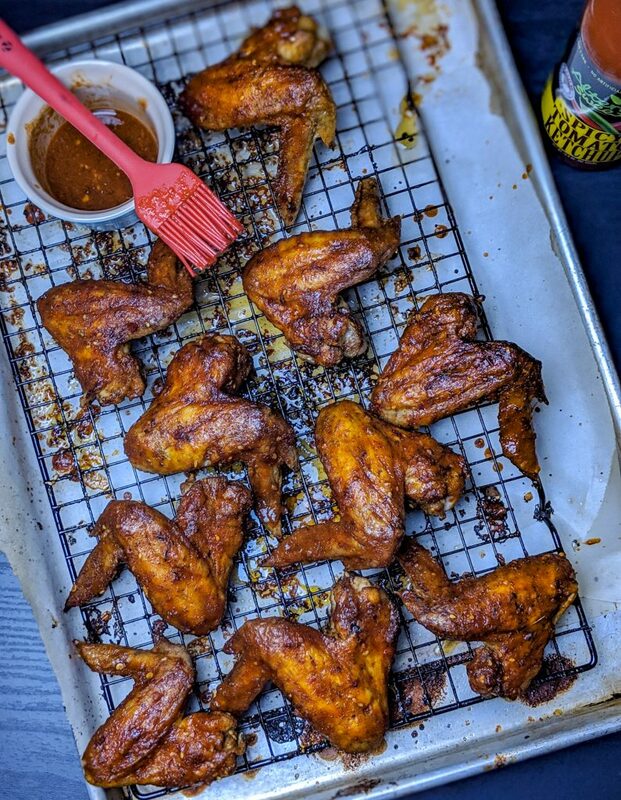 Sure you could just throw some wings in the oven or air fryer and cook them until they are crisp but they never seem to come away from the bone easily and the crispness only lasts a minute or two before returning to a less than optimal texture. 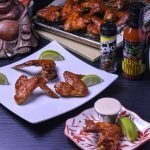 If this doesn’t sound like the kind of wings you want to serve at your next get together then you’ll need to start preparing these wings the night before. 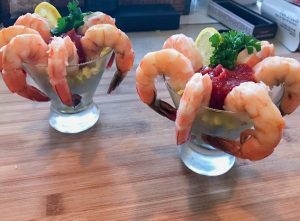 Another advantage to this method is you’ll have less work to do on game day and can spend more time enjoying the game and your guests. When I bake wings in the oven they’re never crispy…HELP!!!! Moisture is the enemy of crispness and salt is the enemy of moisture so by deductive reasoning salt is your friend…in moderation of course. Taking the wings out of the package the night before, patting them dry and dusting them with a light coat of salt, then leaving then in the fridge overnight uncovered will draw out the moisture in the chicken skin without affecting the meat of the bird. If possible store in a wide shallow container or even a sheet pan with a baking rack. The second secret solution to crispy wings is baking powder. Adding the baking powder along with your desired seasoning will almost act as a poultry Botox treatment pulling the skin tight so the wings can crisp up in the oven. Cooking the wings slowly at first at a lower temperature also helps to draw out moisture and if possible I really recommend cooking the wings in the morning the next day then refrigerating them. This will help the wings pull away from the bone when they are fully cooked and it also cuts down on the time cook time later when you want to serve them. 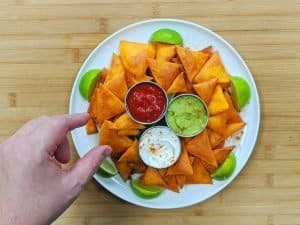 How do restaurants get wings to the table so fast??? If you’ve ever had wings in a restaurant and they arrived in less than 15 minutes they were most likely par cooked. Don’t think that this is a lazy hack just to serve food quicker it actually helps tenderize the meat and crisp the skin even further by expanding and contracting the fibers in the meat. The double “fry” method is often used to create optimal crispness in French fries and other meats. Now that I’ve given you all my secrets to the crispiest oven baked wings on the planet let’s talk about the sauce. We don’t want to drowned the wings in sauce or even the crispiest wing will turn soggy in seconds. I prefer to actually baste my sauce on to each wing, a trick I learned from most Korean fried chicken joints. This method though a bit more time consuming insures each wing an even distribution of sauce while not over doing it. If you are in a time crunch and tossing the wings is required, start with just a few tablespoons at a time. You can always add more and I recommend serving the extra sauce on the side for those guest who want a saucier wing. Pat wings dry and season with salt. Refrigerate overnight or for at least a few hours. Pat dry again and toss wings with 2-3 tablespoon Asian Zing Seasoning along with 1 tablespoon baking powder. After one hour spray or brush your favorite oil or animal fat lightly over the wings to help them crisp up even more. While the wings are finishing up heat a pan over medium with butter, garlic, ginger and scallions sauté until garlic and ginger begin to carmelize . Add remaining ingredients to pan and reduce for 1 minute while stirring. Shut off heat and whisk in 1 extra tablespoon of butter. Once wings are crispy and fully cooked brush the sauce onto each wing individually and serve extra sauce on the side.